What is a Va Form 21 4138? The VA Form 21-4138, known as a Statement in Support of Claim, will be completed by a veteran who needs to establish proof for their claim for benefits. 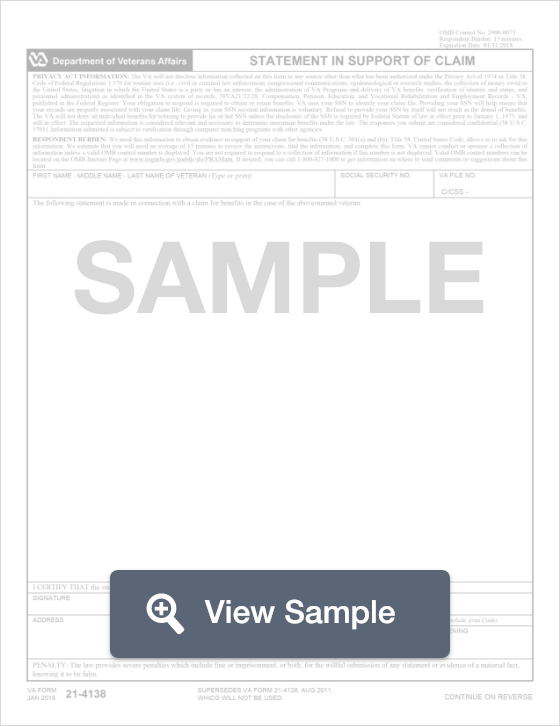 This form will be used by the United States Department of Veterans Affairs. A VA Form 21-4138 is known as a Statement in Support of Claim. This form will be completed by a veteran who needs to establish proof for their claim for VA benefits. The Department of Veterans Affairs will then use this information in order to determine if the claim is legitimate and should be approved. To fill out this form, the party will need to include their full name and social security number. Then, they can write in a statement that supports the request for a VA claim. This statement should include specific details to that the claim for benefits can be approved. Before the form is submitted for review, it should be signed by the individual providing the statement. Create a free Va Form 21 4138 in minutes with our professional document builder. A VA Form 21-4138 is commonly used by a veteran to let the VA know important information when they have filed a claim for disability benefits or disability compensation. Some veterans write about all claims that they have pending before the VA on one form. Other veterans choose to write about just one claim on each form. Any additional information that the veteran would like the VA to know in support of your claim. If you need additional space, you should use the second page. The VA will not disclose information collected on this form to any source other than what has been authorized under the Privacy Act of 1974 or Title 38, Code of Federal Regulations 1.576 for routine uses (example: the collection of money owed to the United States, litigation in which the United States is a party or has an interest, and the administration of VA Programs and delivery of VA benefits) as identified in the VA system of records, 58VA21/22/28, Compensation, Pension, Education, and Vocational Rehabilitation and Employment Records - VA, published in the Federal Register. The requested information is considered relevant and necessary to determine maximum benefits under the law. The responses you submit are considered confidential (38 U.S.C. 5701). The VA needs this information to obtain evidence in support of your claim for benefits (38 U.S.C. § 501(a) and (b)). Title 38, United States Code, allows us to ask for this information. It should take 15 minutes to complete this form. VA cannot conduct or sponsor a collection of information unless a valid OMB control number is displayed. Valid OMB control numbers can be located on the OMB Internet Page at www.reginfo.gov/public/do/PRAMain.